We don’t formally let the fishing at Mindrum, rather selfishly, we keep it for those who live here. We are thrilled, however, if those who are staying with us would like to take a rod out. The Bowmont at Mindrum is best suited to the old fashioned fishing we all used to do as youngsters…very relaxed! 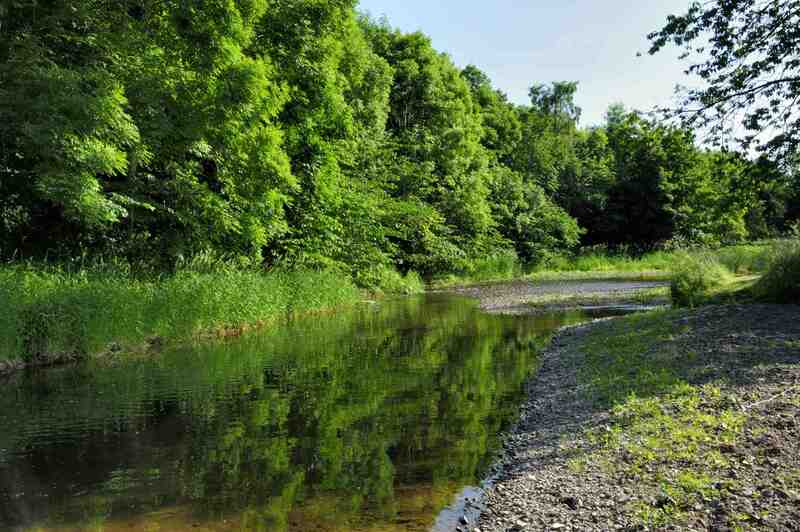 We have informal wild Brown trout and grayling fishing on about 500M of the river Bowmont. It very much depends on the water height and the time of year. Salmon run through in November but aren’t catchable (or edible!) as the redds are just up stream. They can be fun to watch though. Fly, Spin or Worm (the traditional method involves upstream worming with a light fly rod, a worm and a cork!) – the situation makes each method equally sporting and very entertaining. The sea trout run happens (normally) around June to August and we occasionally pull in a big one. You are most likely to catch breakfast trout, but there is the odd wise old big one about – if you are prepared to mount a campaign (they often have to be stalked!). There is lots of scope in some areas for smalls to go minnowing and collecting beasties. There is the odd small pool to splash about a bit – conditions, and parents permitting. Clearly there is more steely fishing available on the Tweed if people want it.